TORONTO, December 5, 2012 - On Thursday December 6, Salt and Light Catholic Media Foundation presents Venite Adoremus 2012 featuring The Priests. 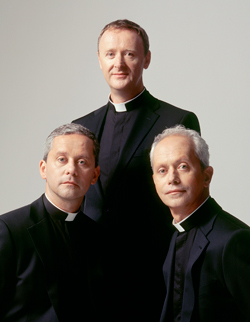 The headlining act will be the internationally acclaimed singing group The Priests, a trio of Catholic clergymen from Ireland. Comprising brothers Fathers Eugene and Martin O'Hagan and their grammar school classmate Fr. David Delargy, these three parish priests from the Irish Diocese of Down and Connor have performed to sold-out audiences in major cities around the world. The Priests will be joined in concert by the Amabile Youth Singers, a youth choir comprising more than forty female choristers ages 12 to 18 from London, Ontario. The evening will also feature the talents of Rosanna Riverso, an award-winning songstress based in Toronto. The evening will also see the participation of the Irish Choral Society of Canada. Tickets for this event are sold out, however those interested in taking part in the event are encouraged to visit the Salt + Light website to view the live stream.